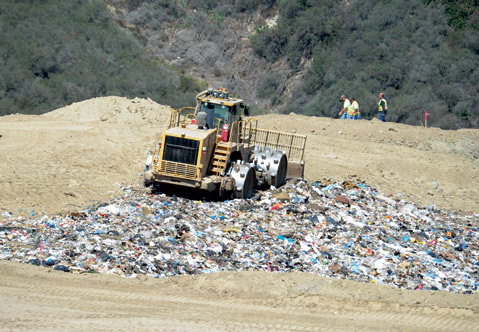 Not all members of Santa Barbara’s City Council were thrilled to learn that the public-private partnership they’d contractually entered into six years ago to build a $100 million, state-of-the-art recycling operation at the Tajiguas landfill had ceased to exist. Councilmembers were informed that the contractor ​— ​Mustang Associates out of San Luis Obispo ​— ​could not deliver the financing needed to build the new 80,000-square-foot industrial operation. Mustang won the bid six years ago because it pledged to finance the project using private funding sources while also keeping the dumping costs ​— ​known as a tipping fee ​— ​to no more than $100 a ton. It turns out that planting such a massive facility on the landfill’s notoriously squishy terrain is a lot more complicated and expensive than anticipated. Using private capital, the lowest tipping fee Mustang could promise was $126 a ton, way over budget. Tipping fees could only be reduced to the $100 mark, the council was told, if the project were built with government financing. In this case, the County of Santa Barbara Public Works Department would secure the funds. The high-tech operation is estimated to extend the life of the landfill, now approaching capacity, by 12 years. The other option is to ship local trash to landfills north or south, where tipping fees are significantly cheaper. City and county trash planners ​— ​who have worked 13 years on this project and are loath to change direction ​— ​note that when traffic costs are factored into the price of even the cheapest location, the Tajiguas plan will be competitive. While the County of Santa Barbara is the lead agency, the City of Santa Barbara supplies 40 percent of the material getting landfilled. Also joining are the cities of Buellton and Goleta. Despite some grumbling, the council unanimously directed county trash planners to explore public financing options.